The Qingjing Mosque, also known as the Ashab Mosque, is located in the center of Tumen Street in Quanzhou. 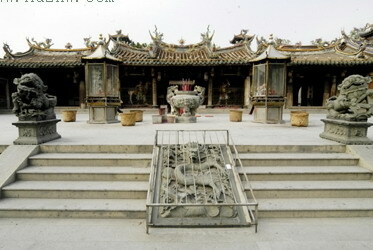 Throughout the Song Dynasty (960-1279), Quanzhou City was one of the key ports of foreign trade and attracted many Arabs. The mosque, built and repaired by Arab Muslims, reflects the friendship and cultural exchange between China and Arabic countries. Imitating a mosque in Damascus, Syria, it was initially built in 1009 and today is the oldest Arab-style mosque in China. This magnificent mosque covers an area of 2,500 square meters (0.62 acre) and features a gate, the Fengtian Hall, and the Mingshan Hall. Facing south, the gate is made of diabase and white granite and consists of four conjoined archways. Many of the gate's domes are carved with hanging lotus, symbolizing respect for sanctity and purity. Each carved lotus is surrounded by a web of liernes, which add depth to the carvings. A platform on the roof of the gate allows worshipers to watch the moon and decide when Ramadan begins. To the east of the gate are two stone tablets recording the reconstruction of the mosque in the Yuan (1271-1368) and the Ming (1368-1644) dynasties. Another stone tablet is located just near the gate, engraved with the imperial edict of Zhu Di - the third emperor of the Ming Dynasty. He spread this edict to protect the Mosque and the Islam in China. After the earthquake damaged Fengtian Hall, Mingshan Hall became the mosque's central prayer hall. Located in the northwestern portion of the Mosque, Mingshan Hall was built in a more Chinese style and is smaller than Fengtian Hall. It is a quadrangle - resembling a traditional residential compound with a courtyard (common in northern China). Here the stone walls are adorned with Arabic inscriptions dating back to the Song and the Yuan dynasties. The ancient history and unique blend of Arabic and Chinese architecture in this holy mosque are sure to linger in your memory long after your visit.